At first glance, one might wonder at the choice of the name for the children’s hospital in Memphis that has been providing exceptional healthcare services for more than a half-century. The French “Bonheur” translates as “happiness” into English. But bringing a bit of happiness into young lives by providing children with top quality medical services ranging from treatment of the ordinary bumps and sniffles associated with childhood to the most life-altering extremes has been the focus of Le Bonheur Children’s Hospital since the facility opened its doors on June 15, 1952. 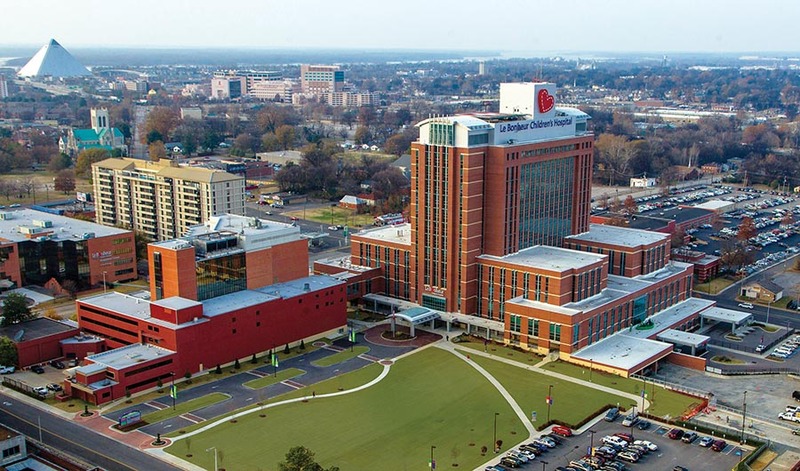 Le Bonheur is a 255-bed tertiary care children’s hospital conveniently located in downtown Memphis in the heart of the city’s Medical District Collaborative. The main campus on Adams Avenue includes the hospital, emergency department, outpatient center, outpatient rehabilitation services, Children’s Foundation Research Institute and FedExFamilyHouse. Le Bonheur has locations in East Memphis; Jonesboro, Arkansas; Tupelo, Mississippi; and Jackson, Tennessee. Each year, Le Bonheur serves approximately 250,000 patients. The hospital’s emergency department alone sees approximately 80,000 patients annually. Le Bonheur’s healthcare professionals perform 13,000 surgeries each year and treat 2,500 intensive care cases. 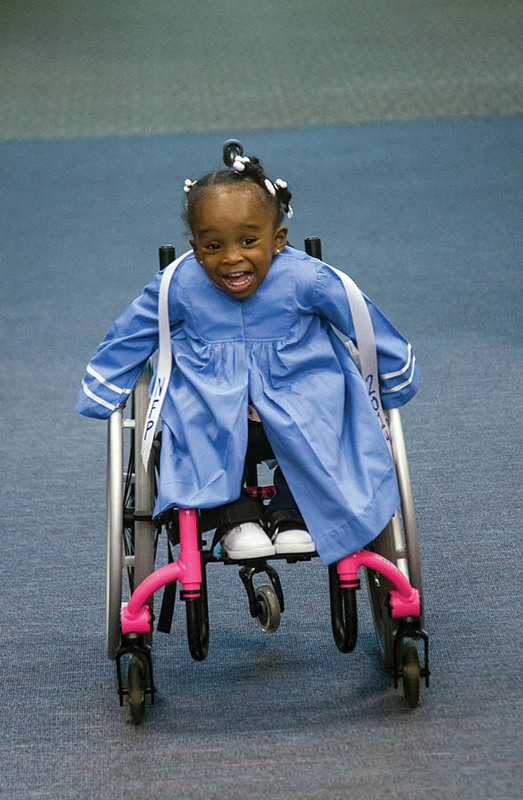 Le Bonheur sees children from around the world with its nationally-ranked Neuroscience Institute and Heart Institute. The pediatric brain tumor program, a partnership with St. Jude Children’s Research Hospital, operates, treats and cures children with brain tumors. The Children’s Foundation Research Institute has recruited the nation’s top researchers and physicians working to cure pediatric disease. Dr. Umar Boston, Surgical Director of Heart Transplant and Mechanical Circulatory Support at Le Bonheur spends some time with one of his heart transplant recipients. The hospital’s 2,555 employees, including 700 dedicated medical staff, take great pride in being passionate advocates for children. The hospital offers 45 pediatric specialties. Le Bonheur is a Magnet-designated facility, the ultimate credential for excellence in nursing care. Le Bonheur functions as the region’s only primary Level 1 pediatric trauma center. 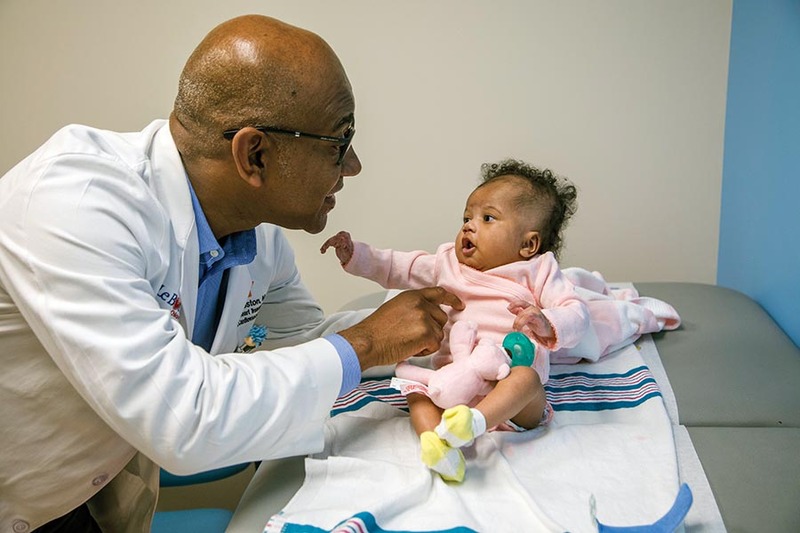 Serving as a teaching hospital affiliated with the University of Tennessee Health Science Center, Le Bonheur trains more than 350 pediatricians and specialists each year. And The Leapfrog Group named Le Bonheur a “Top Children’s Hospital” in 2017 — one of the most competitive honors hospitals can receive when it comes to safe patient care. Exceptional pediatrics was the focus of the hospital’s founders and remains so today. Le Bonheur pursues this goal by providing the highest level of care through quality improvement and research into the diseases that affect children. The hospital’s specialists work together as one team to provide exceptional care for every child. Le Bonheur’s family-centered-care means partnering with families as an essential part of the care team. While there are thousands of hospitals in America, only a few of those care exclusively for children. Le Bonheur’s professionals realize that children are not small adults. They require the equipment and facilities designed around their own specific needs. A children’s hospital brings together many experts focused on one thing – your child’s care. 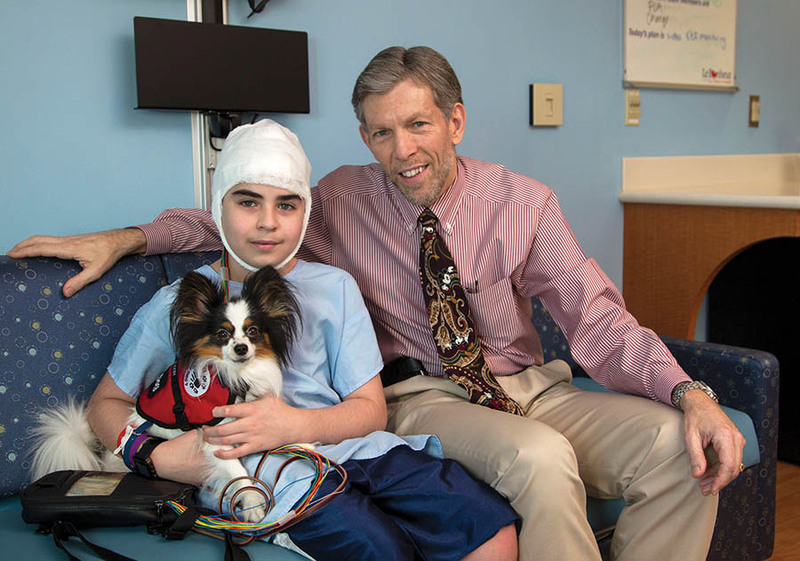 Comprehensive Epilepsy Program shares time with one of his patients and his seizure dog. The nationally recognized Neuroscience Institute at Le Bonheur serves as the regional and national hub for the evaluation and treatment of neurological disorders in children and adolescents. Being recognized as a leader in pediatric care means offering a complete range of clinical specialties in the diagnosis and treatment of children’s medical issues. As one of the nation’s best children’s hospitals, Le Bonheur features expert physicians and staff, state-of-the-art technology and family-friendly resources to maintain its leadership position in the field. The Neuroscience Institute – The nationally recognized Neuroscience Institute at Le Bonheur serves as the regional and national hub for the evaluation and treatment of neurological disorders in children and adolescents. The Institute’s physicians and surgeons treat children with rare forms of pediatric brain tumors and epilepsy from all over the world. The Heart Institute – Le Bonheur’s Heart Institute, also nationally ranked, provides exceptional care by utilizing advanced technology and skillful physicians to create a cardiovascular center of excellence. For moms in Le Bonheur’s Nurse Family Partnership, watching their 2-year-olds cross the stage in blue graduation robes is a culmination of a three-year journey. Moms in the program receive regular home visits from a Le Bonheur nurse throughout their pregnancy until the child’s second birthday. NFP has improved pregnancy outcomes, child health and development and families’ economic self-sufficiency in Memphis since its beginning in 2010. Le Bonheur’s promise to the community and region started in 1952 as the first comprehensive pediatric facility in Memphis. The hospital’s work sets the standard for training pediatric caregivers and helps to expand the frontiers of new knowledge through research and innovation. The expertise and resources of Le Bonheur Children’s Hospital extend far beyond hospital walls. Through Le Bonheur Community Outreach, the hospital’s professionals are addressing issues such as safety, teen pregnancy, and access to health care that threaten the health and well-being of the region’s children.